A Year of Being Here: Richard Jones: "Rapture"
in the cracks of the well. never see his sons again. "Rapture" by Richard Jones. Text as published in The Blessing: New and Selected Poems (Copper Canyon Press, 2000). 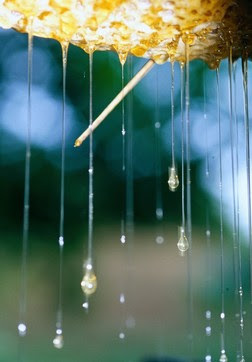 Art credit: "Honey dripping from nest of Giant honey bee (Apis dorsata binghami)," photograph taken in Indonesia by Nature Picture Library. Gentle reminder: Sign up for our End-of-Project Book Giveaway or download a free album of holiday music by Tuesday, December 8. Read the details here. Why is this called poetry? Does the poem give you a feeling? Mine is one of horror made more so by the last stanza. It reminds me of a dream I had decades ago, after my parakeet was eaten by my cat. In the dream Ringo, terrified, had lain his head against Tiger's shoulder for comfort, knowing that the inevitable was near. The dream was more disturbing than the murder. My, different readers, different experiences of the same poem! I'm so sorry you found this poem horrifying, and disturbing. I loved it and have saved it to my favorites! To me, poetry doesn't have to be soothing and pretty, but is successful if it inspires a strong feeling. Interesting. Thank you for elaborating!